I am currently involved in the finance/commodities world as negotiator. I am also a fashion designer and have bravely showed in Paris during Haute Couture Week. I am currently working on a few ideas and hope to make my way back towards making a big splash again after a realisation incubation period. So watch out! 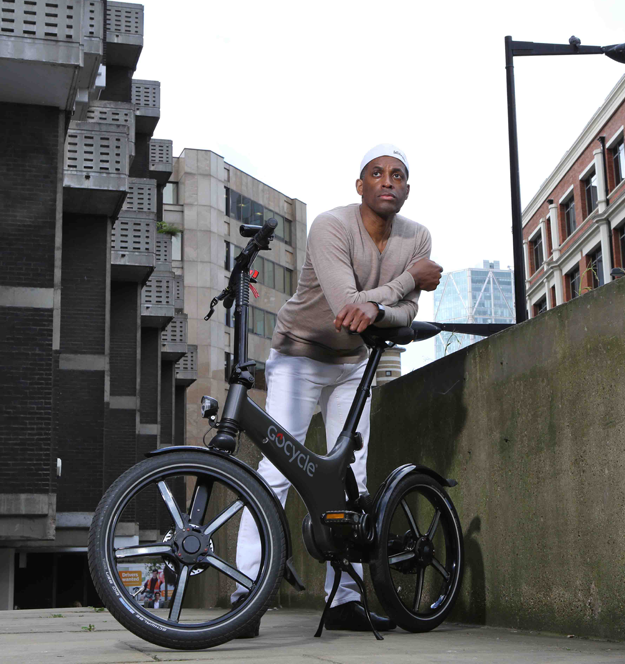 I was never a cyclist until I discovered Gocycle by designer Richard Thorpe. I would also proudly say that I was one of the first pioneers of the Gocycle. I went for a test ride and I was literally blown away. I wanted to take it home with me. This was the first time I ever rode an electric bike and I have never looked back since 2009. I even took my Gocycle to Paris and I believe I was the very first to have a Gocycle in Paris and rode it up and down the Champs Élysées. I love to see people's faces when they see a cycle like this, I'm used to people stopping to look. Only my Gocycle I'm not interested in anything else. I have been called lazy. I guess I am a bit lazy when it comes to cycling. Gocycle is also very special because it has Bluetooth built into it so I can control the speed and the tension resistance when cycling so in effect I can actually give myself a good workout, count the miles plus monitor my battery level. All of this and more are programmable from the Gocycle iPhone App. 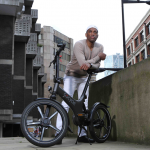 The Gocycle is a fantastic and amazing bit of artistry, innovation and genius. The ease and freedom you have especially in a large area. And the fact of knowing that you're getting somewhere. Not as much as I'd like to. But at least 3-5 times a week. During the summer months I really love the stretch of bicycle lane which seems to start at Wellington Arch (Hyde Park Corner) then runs alongside Buckingham Palace (Constitution Hill) on to the Mall, ending up joining the madness of Trafalgar Square. Along this route I feel a beautiful calmness and freedom with a bit of solitude and time to relax and think as the breeze whistles between my ears. This entry was posted in Velorutionaries and tagged Velorutionaries, Saint-Hill Thompson on 10th June 2015 by Velorution. I’m the PA to the Chief Executive of Grosvenor, a family property company that owns a large chunk of property in Mayfair and Belgravia. I had a bike as a child, but as an adult I bought a Pashley back in 2011, as I’d become fed up of using public transport. I moved on to my first road bike, a Specialized, the following year. Thanks to a very well-timed visit to Velorution and having been on the lookout for a new bike for about 6 months, I’ve just bought a rather gorgeous Van Nicholas Ventus VR. Being quite short, I’ve struggled to find an off-the-shelf bike to fit and that isn’t pink or purple. We just happened to pop into the shop one afternoon and Jonathan was trying to find a place for a 48cm bike to go on display… It never did get on display; I took it out for a test ride and bought it. The obvious things, like avoiding the tube and the exercise that allows me to consume a good curry and a regular cinnamon bun. I also like the social side of cycling; through Twitter and various bike shows I’ve made new friends and have enjoyed riding with one or two cycling clubs for longer rides out of London, something I plan to do more of with the new bike. I’ve also enjoyed investigating cycling gear. There are some great brands out there and I tend to dip into two or three when buying clothes for riding. Every day! 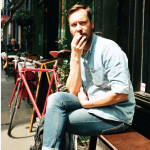 I ride to work via a couple of laps of Regent’s Park – I live in King’s Cross and work in Mayfair, so the couple of laps make it a little more worthwhile. At weekends I do longer rides, out to Richmond and various parts of Surrey or Hertfordshire, always ending at a café for coffee and a cinnamon bun. I did a sportive last year in the New Forest. Although windy, I thoroughly enjoyed riding through the villages avoiding the ponies and enjoying the scenery. We’ve been back since, borrowing mountain bikes for riding the trails. My son really enjoyed finding as many puddles as possible, making sure he went in front so that I got the mud spray behind him! This entry was posted in Velorutionaries and tagged Velorutionaries, Helen Pinkerton on 10th June 2015 by Velorution. I'm an architect with my own practice called Studio Mackereth. 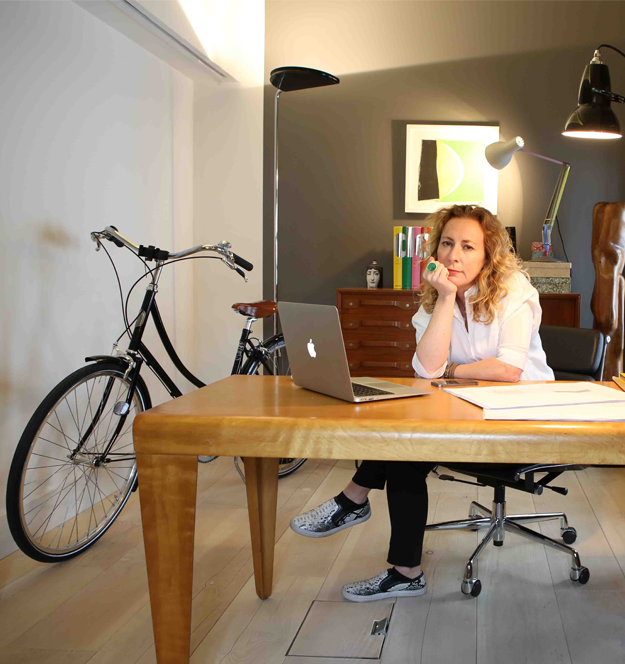 We recently designed and built our own office from some derelict former Victorian stable blocks. We specialise in high-end residential buildings, global luxury retail design, galleries and bespoke furniture. I wouldn't call myself a proper 'cyclist', but I have had a bike for years in the countryside. I like the freedom of a car-free day, just cycling to the post office or down to the beach with the children. I've only recently braved the idea of cycling in London. For Norfolk I have an Electra beach cruiser bike from California. It's really fun to ride: white tyres with green rubber trim, a Hawaiian print tooled leather saddle and white leather fringes fluttering from the handlebars. By contrast in London my new much-loved bicycle is a black glossy Pelago from Helsinki. The frame has a pleasing shape - not retro but traditional and simple. It's really very comfortable too. I drive an old classic car but getting around central London during the day is too slow and stressful. I've discovered cycle lanes and can now reliably predict my arrival time at meetings. I don't go particularly fast and I refuse to wear special cycling clothes (except my trusty Bern helmet). I'm often in a dress and sometimes heels, tootling along past all the traffic. As an architect I'm always looking up at buildings and I definitely see more and connect differently with this vibrant city on my bike. I confess I'm a fair weather cyclist. While the sun shines I'm loving my bike rides, so I use it most days in the Spring/Summer. I try to use the cycle lanes as much as I can as I feel safer, but from time to time I'll take in back streets and cross the parks, which is a lovely way to explore London. One of my favourite cross-town trips in the morning sunshine takes me from my studio in Kings Cross through Bloomsbury, Noho, Marylebone, whizzing past all the queuing traffic and down into Mayfair to join a friend for breakfast. This entry was posted in Velorutionaries and tagged Velorutionaries, Sally Mackareth on 10th June 2015 by Velorution. I have a small property firm and run a small hotel in Phuket, Thailand. Ever since I can remember. I got into biking very young and was into BMX when I was 10 years old. I also had a Raleigh Chopper, but it all rusted and we had to scrap it. What kick-started your passion for bikes? I guess the sense of freedom, particularly when you’re very young. You can’t drive, so if you don’t cycle then you can’t go anywhere. Once you get on your bike, you can just about do anything. Home for me was Bangkok. I used to do freestyle BMX – bunny hopping and jumping – but I didn’t enter tournaments. It was just for fun. 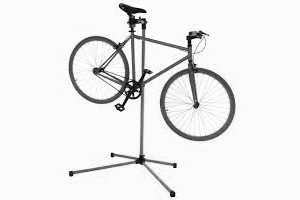 When I was looking at buying a new bike, I went to Selfridges first, where they had a bike stand, and saw they carried my favourite brand of bicycles, which is Moulton. And I'm actually just on my way back home from the factory today as we speak. Velorution's owners Jonathan and Gretta helped arrange a factory visit for me, and it was great fun! How often do you get on the bike? It all depends. In England not as much as I ride in Thailand because we haven’t got the weather. In Thailand I will go for a ride three or four times a week: sometimes for a long distance, sometimes for a short distance. I used to race mountain bikes for four years in Phuket when I was in my thirties. There is a real culture of riding bikes within Thailand and many different types of cyclists – there are mountain bike racers, triathletes, small wheelers and people who just go on bikes for exercise. In different stages in life you do different things. Right now I’m just trying not to get too heavy and to stay relatively healthy, but I don’t race the bikes any more. For me these days, cycling is more recreational and social. Do you have a favourite place to ride in Britain? I ride near the house in Hyde Park, or through Richmond Park. I almost did the London to Brighton bike ride this year. In Thailand we still do social rides at the weekend, where either a small or a big group of us will take a trip to a different part of the country. This entry was posted in Velorutionaries and tagged Velorutionaries, Sukhathai Chumbala on 10th June 2015 by Velorution. I am Managing Director of Pol Roger Portfolio; the UK agents not only for Pol Roger Champagne (one of the very rare great champagne houses still in family hands) but also for a small number of top end family owned wine and spirits producers. Pretty much all of my life. I was lucky enough to be brought up at a school near Tunbridge Wells and spent much of the summer holidays racing round the grounds on my cycle (think I was nowhere near trendy enough for a chopper). Then came back to cycling up in Cambridge where I spent a great three years tasting wine, playing rugby and doing just about enough Classics to pass my degree. A splendid Stanforth Kibo. Had a fun couple of hours at Velorution going through the options and riding round the block on a selection of outstanding bikes; but ended up going for the Kibo. Suspect that it was entirely down to the colour of the tyres (a deeply unpractical white) but also loved the riding position and relative speed (certainly compared with my old knackered heavy mountain bike). The fact that I can watch the world go by at a rather more gentle pace; the fact that that Casta (a German Short Haired Pointer) loves running alongside the bike on the way to and from the office; the fact that I can leave the car at home and, in most cases, get where I am going far quicker. And the fact that cycling is a great antidote to eating and drinking too much in the Wine Trade. Assuming that I am heading to the office in Battersea (just up the river from home), tend to head to the office and back on the bike. And, with the summer almost here, also great to take the dog out either in Battersea Park or down the river to Wandsworth Park. Depending on the weather, I tend to head down to Sussex and take the bike up on the South Downs (there is a secret car park up above Bignor from where one can cycle in all sorts of directions). Or leap on the cycle from Battersea and go all the way down the river to Hampton Court and back. 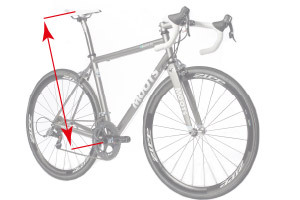 This entry was posted in Velorutionaries and tagged Velorutionaries, James Simpson on 10th June 2015 by Velorution. I’m a News and Documentary filmmaker for the BBC, specialising in investigative journalism. For the last eighteen months I have been working in some of the World’s most toxic war zones – Syria, Iraq, Afghanistan and Gaza. I’ve also travelled to Iran, Tajikistan and Belarus this year. I have been a cyclist for around a year. I was working in Homs in Syria last April when a mortar bomb hit our vehicle; my colleague and I were lucky to escape with our lives. On my return to London I had trouble using the London Underground because it made me feel claustrophobic and so a bike seemed like a good option. My bike chose me. I was walking past Velorution and the beautiful bicycles in the window called out to me. 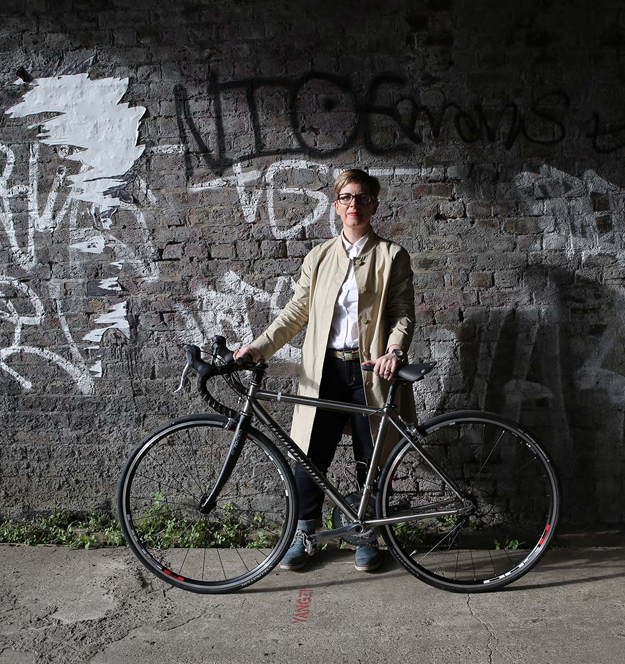 I test-rode a few models but as soon as I sat on my elegant Schindelhauer Lotte I knew that it was right for me – it’s an incredibly elegant modelwith 8 gears, a Brooks saddle and hand-sewn leather grips. I spend a good deal of my working life travelling through the streets of apocalyptic cities in a soft-skin vehicle wearing a flak jacket, when I’m back in London riding on my bike, I feel free. I’ve become very evangelical about cycling: I love the pace at which you view the world while riding on a bike - I have time to take in the landscapes I am travelling through and I now have a better appreciation of the beauty and amazing architecture of London. 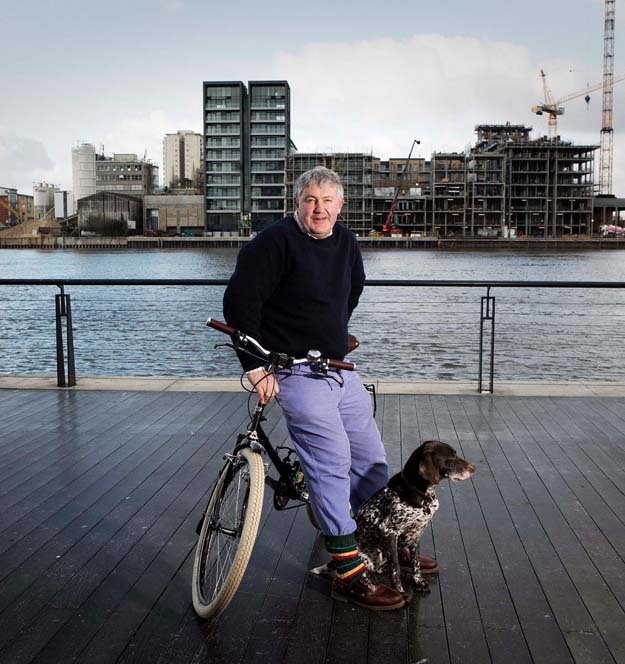 As often as my work allows – on average I travel for three weeks of every month, when I’m at home I try to ride everyday since it helps with my physical and psychological wellbeing. I’m fortunate enough to live near Hampstead Heath, so I have a forty-five minute route through this island of countryside, past the ponds and through woodland and meadows. I sometimes commute to work in Central London, freewheeling through Regent’s Park with the wind in my hair as the sun rises is a truly exhilarating experience. 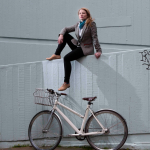 This entry was posted in Velorutionaries, Schindelhauer and tagged Velorutionaries, Natalie Morton on 10th June 2015 by Velorution. 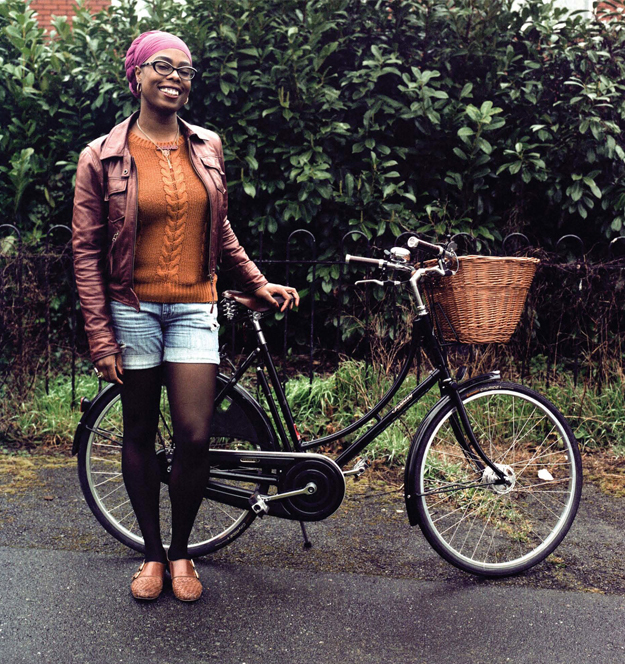 There was a mix of reasons why I’d stopped cycling by the time I was 18; I wasn’t feeling that confident on the roads anymore, and I’d managed to convince myself (through my own fears of London’s traffic) that it wasn’t the best transport option to get to uni. As time went on, I really missed the freedom and happiness I’d get out of riding and at 28 I got my dream bicycle: a Pashley Princess. Even in all the excitement about cycling again, I’m not ashamed to admit I was pretty nervous about it all… it was a long time since I’d been on a bike and there were even serious moments of doubt when I was riding the Pashley home from the shop, to the point of thinking I’d give it up as soon as I got indoors! Three years (and now owning three bikes) later, and I can certainly say getting back on the saddle has turned out to be one of the best decisions I’ve ever made! I’ve actually fallen in love with cycling and the way it has changed my life. The way I think, feel and see life is very different to the person I was three years ago… and it’s all thanks to the bicycle. 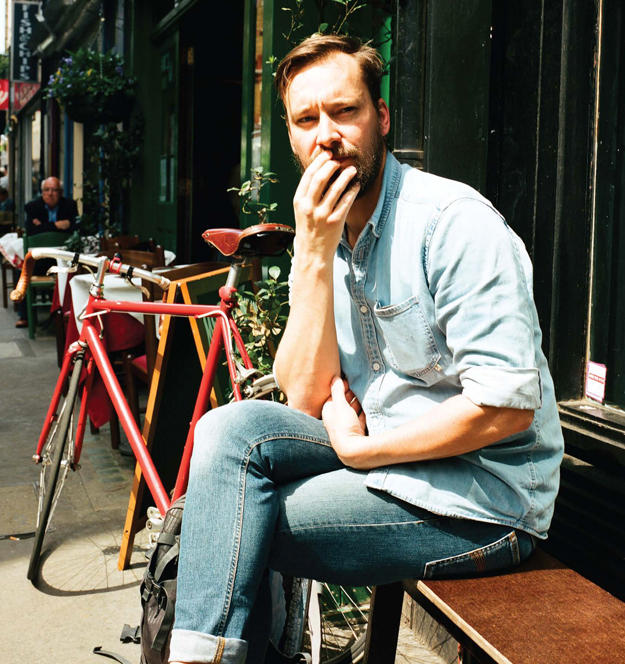 What advice would you give to people don't cycle? It’s never too late to take up cycling and I say go for it! 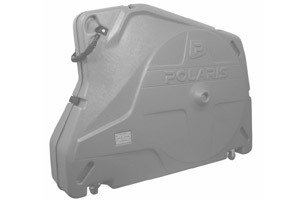 Do some research and look into getting a bike suited to your needs. Then go at your own pace. Be safe, be happy and enjoy the freedom of riding a bike! 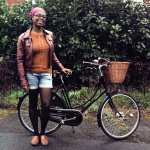 This entry was posted in Velorutionaries and tagged Velorutionaries, Jools Walker on 10th June 2015 by Velorution. Many many things, some more interesting than others, but even then only interesting to me. I certainly don't believe in free time. I try to occupy my time making something I enjoy doing better. So perhaps one day, I may actually be good at something. I ride a Fort frame with Mavic wheels and some other nice components. It is my main mode of transportation for everything, apart from after too many beers. It wasn't a conscious decision, it was just something that happened naturally. 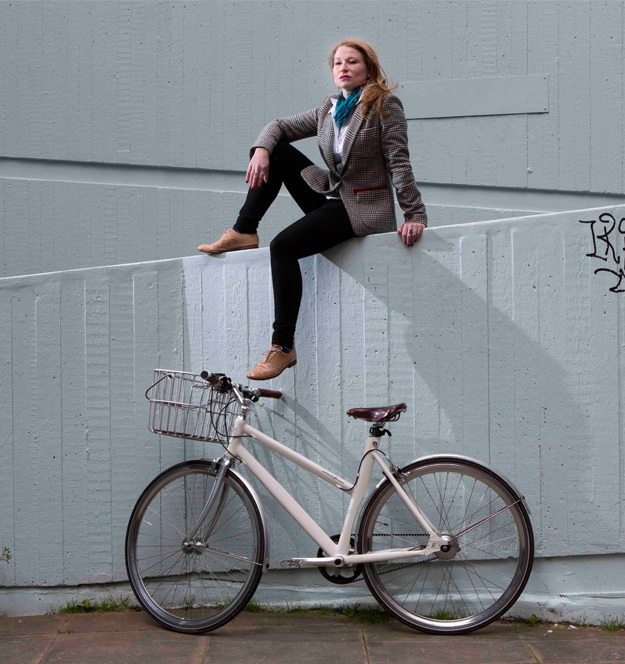 What do you love about cycling in London? Finding new bars and things like records shops that you can only see by being overground and travelling. I recently found one that isn't even on the internet, which seems strange actually. 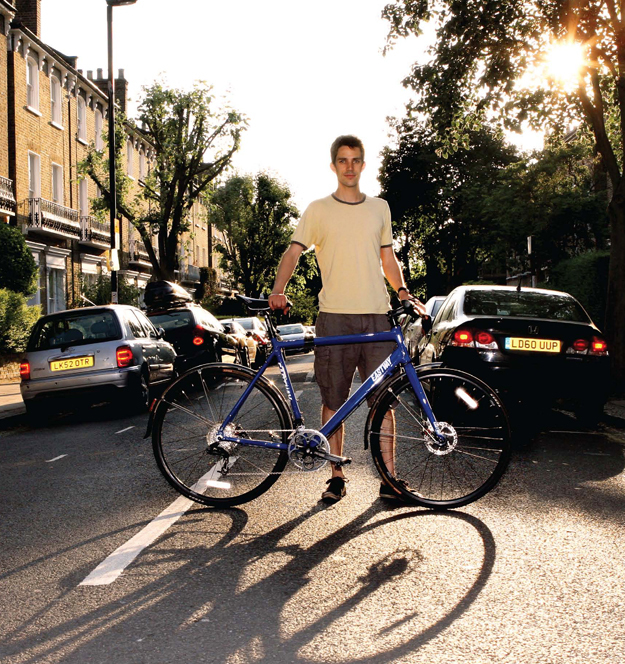 What do you dislike about cycling in London? It seems like there is a lot of aggression from motorists toward cyclists. 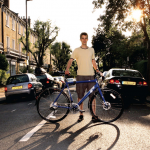 I think we should look after those more vulnerable, and as cyclists, we are certainly that. The french alps. No brainer really. 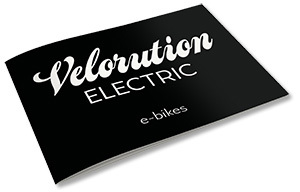 This entry was posted in Velorutionaries and tagged Velorutionaries, Arthur Dyjecinski on 9th June 2015 by Velorution. Since I was five or six I guess, but in London for two years. Eastway FB 4.0, a hybrid. No more than three. One every 10 years. Almost every day in summer, but only one or two times in winter. This has to change! How do you normally get around town? By bike, by foot and on public transport. 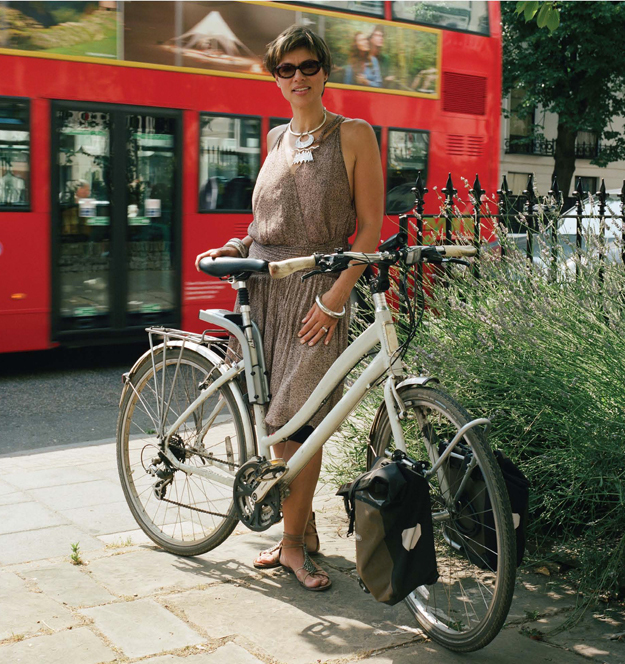 What’s the appeal of cycling in London? And is there anything you dislike? I like saving time, enjoying London outdoors and being able to choose my route as I fancy. I don’t like reckless cyclists and the impression of being in a permanent race. Cyclists on the Continent are much more civilised! Any of the London bridges, and the Regents Park Outer Circle. 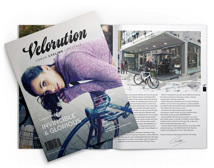 How did you discover Velorution, and how have you found the experience of shopping there? I came across Velorution by chance while walking on Great Portland Street. I really liked the design touch of the bikes there, and the dedicated spirit of the team. For anyone who wishes to make a quality purchase, this is the place to visit. This entry was posted in Velorutionaries and tagged Velorutionaries, Renaud Thillaye on 9th June 2015 by Velorution. I was born in London, but my family are from Colombia. I have 3 kids, and live in Brixton. 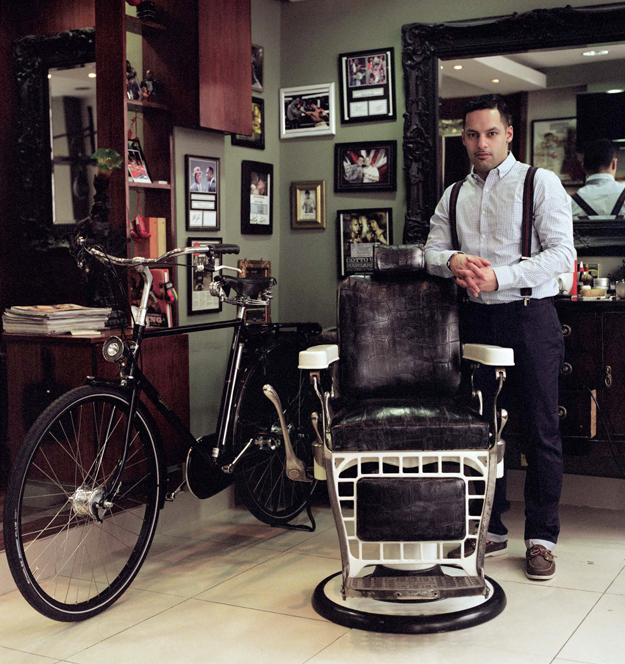 I opened Champs Barbers in Fitzrovia after working for someone else for 15 years, and always felt that I could offer a better service. At Champs I provide our customers with more than just a haircut; drinks are available, plus you get a free head massage with your cut. 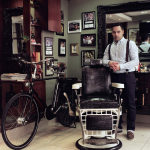 We also specialise in hot towel shaves. My chair is 100 years old it’s a J Paider model and came from Chicago USA. I first started riding my bike with my Dad. He was a keen cyclist, so I guess that’s where I caught the bug. Cycling was one of his sports; he had his trophies all around the house. I used to go out riding with him on a Sunday when I was a kid. He’d take me on long distances, for the whole day. My first bike was a black and gold BMX. I have several bikes now, mainly road bikes. When I’m in Columbia I ride Mountain bikes. I love cycling because you can be on your own, and clear your mind as you ride along. It also gets you super fi t. Cycling helps me get ready for my other passion, boxing. I’m pleased we’re going to have proper cycling lanes in London, then there will be a lot more bikes on the streets. What do you like about Velorution? Everything in the shop. The unique bikes, all the classics, you know I like my classic bikes, just like my chair! This entry was posted in Velorutionaries and tagged Velorutionaries, Ian Hoyos on 9th June 2015 by Velorution. Organic beauty product CEO, author, and I appear on television too. What is your earliest memory of cycling? My dad renovated an old bike for my seventh birthday. He used to renovate Lambretta scooters. I just loved that bike! I now ride a customised Urban Flying Machine. Too many to count. I have owned many bikes over the years. I ride my bike most days in good weather... I go to the office, shops, gym, or anywhere else I need to get to. As I live in London my bike is my first option, then a cab. 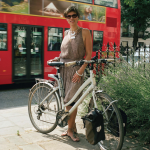 What is the appeal of cycling in London? What do you love about it? I love cycling in London. It’s a kind of freedom for me, plus of course I get exercise. I dislike the traffic, and find the buses scary. 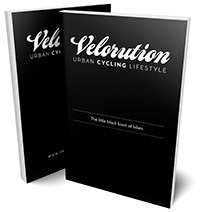 How did you discover Velorution? I discovered Velorution when I cycled past on my old bike and thought, “If ever I need to get a new bike, I will go there…” Then my old bike got stolen! 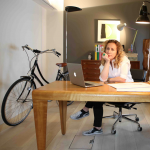 This entry was posted in Velorutionaries and tagged Velorutionaries, Jo Wood on 9th June 2015 by Velorution. Around ten years. I used to compete in triathlons and had a beautiful Pinnacle racing bike, but then I had to have a back operation and it put a stop to any running. But it did mean I started cycling even more. It’s my trusty stalwart – a Globe that I call Betsy. It’s been the most brilliant bike. I bought it around four or five years ago and it has taken a mighty battering, but it has completely stood the test of time. She’s not all that glam, but she was a great buy. Only three. I’d love to have a different bike for different occasions: a Pashley for riding around home, a racing bike, like the Urban Flying Machine I saw in Velorution, and then perhaps a replacement for Betsy, although I can’t bear to think about that one just yet. I commute around 14 miles a day in to the BBC in central London. 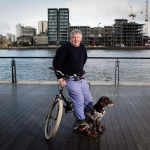 What’s the appeal of cycling in London? I love cycling past all our National landmarks, whether it’s cycling up the Mall with Buckingham Palace rising up in front of me, or through the Royal Parks, which are simply glorious. I just love it, and to see the seasons change too is a privilege. Around Richmond Park – I love putting my daughter in her seat behind me and we take off with a picnic. It is heavenly. 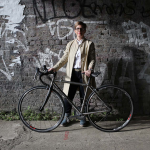 This entry was posted in Velorutionaries and tagged Velorutionaries, Kate Silverton on 9th June 2015 by Velorution.